I didn’t know too much or have any contact with my great grandmother Jessie Belle Moorer Cox’s family before I started researching, so I never thought I would find, let alone meet any of her relatives. 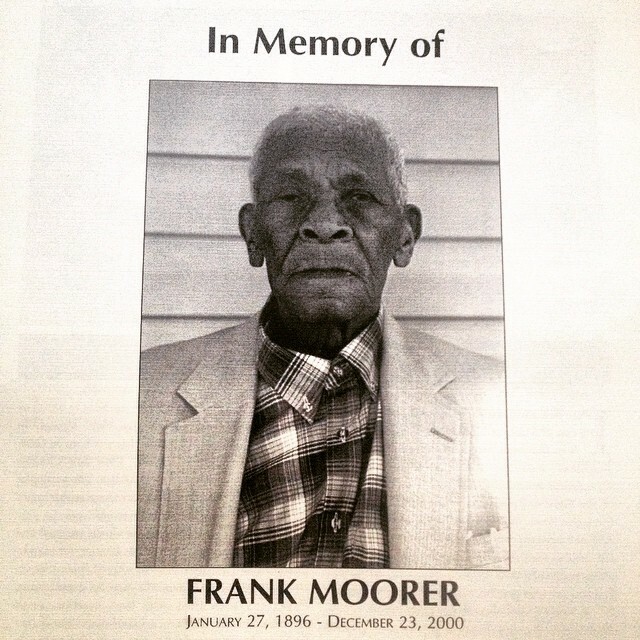 Well allow me to introduce you to Frank Moorer Sr., Jessie’s first cousin. Frank was one of 12 born January 27th 1896 to Thad Moorer and Caroline Hale in Farmsville, Lowndes County, AL. Frank lived until rightful age of 104 years old. Frank was the “living connection to the past, for he had known many people who had been slaves, who has witnessed the Civil War and Reconstruction.” Last September I had the great pleasure of meeting four of Frank’s children who shared memories of their father. Connecting with them was amazing.